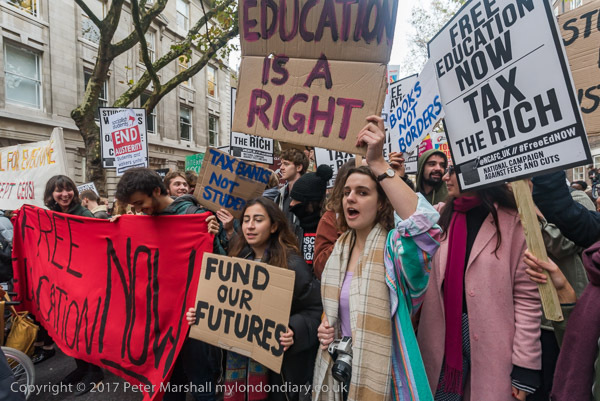 Students marched through London calling for an end to all tuition fees, for living grants for all and an end to the increasing marketisation of the education system that is resulting in cuts across university campuses and a dramatic reduction in further education provision. 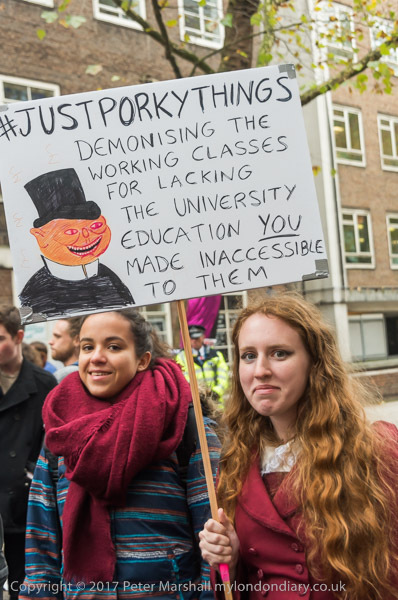 They say that the Teaching Excellence Framework which was supposed to ‘drive up standards in teaching’ is intensifying the exploitation and casualisation of university staff as a part of the marketisation agenda. 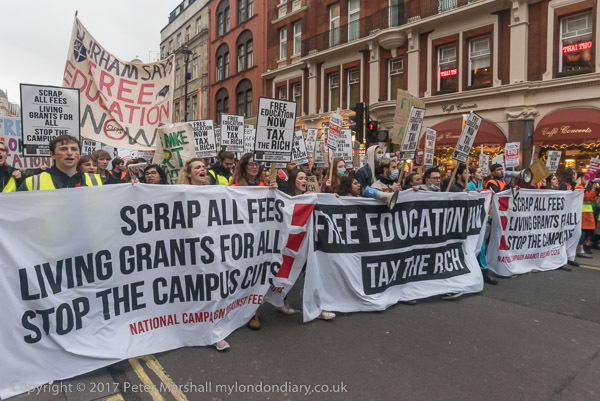 The march was organised by the National Campaign Against Fees and Cuts. 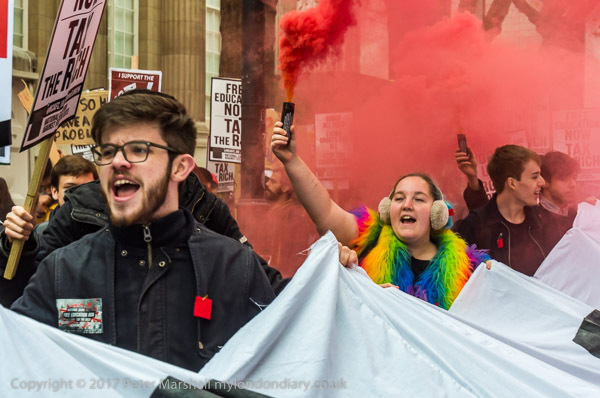 Shakira Martin, NUS President, was elected on a manifesto which included her promise to “Fight for a Minimum Living income for all students and securing the return of Grants” but somehow that didn’t include supporting this march. And although she was criticised by the other candidates for her failure to actually get involved in the fees campaign, she was easily re-elected for her second term this year. 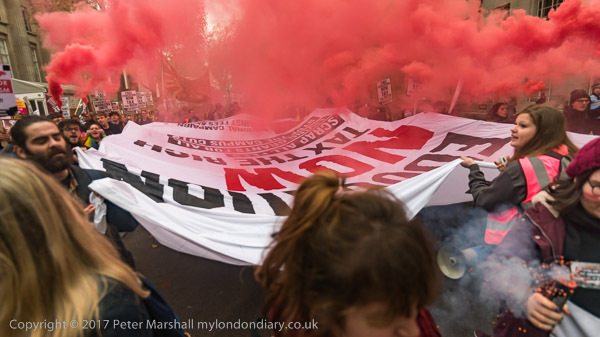 As usual now for student and some other protests, the march was accompanied by liberal pyrotechnics, as show in quite a few images on My London Diary. The one at the top of the page is a little unusual, but only in its aspect ratio. For some reason the RAW file produced by the Nikon D750 is only 6016×3376 pixels rather than the normal 6016×4016 pixels, corresponding to 16:9 ratio rather than 1.5:1. I didn’t know the camera could do this. Looking at the D750 manual it would appear that this is possible when taking pictures with the camera in Movie Live View, if Custom Setting g4 is set to ‘Take pictures’, and pictures use whatever Image Quality setting has been made in the photo shooting menu. So my mistake was having the Live View selector on the camera back in Movie rather than Still mode and putting the camera into Live View. It works in much the same way on the D810 as well. I find that Live View is often a problem for still images in any case unless you use manual focus, as managing to get focus is sometimes a major problem, with some lenses momentarily giving a green rectangle to show focus, then going off to whirr away again. It’s one aspect where Fuji – where the view is always live – really does so much better. Perhaps there is something wrong with they way I press the shutter? There are no adverts on this site and it receives no sponsorship, and I like to keep it that way. But it does take a considerable amount of my time and thought, and if you enjoy reading it, a small donation – perhaps the cost of a beer – would be appreciated. All photographs on this and my other sites, unless otherwise stated, are taken by and copyright of Peter Marshall, and are available for reproduction or can be bought as prints. This entry was posted on Sunday, April 22nd, 2018 at 09:50 am and is filed under My Own Work, Political Issues, Technical. You can follow any responses to this entry through the RSS 2.0 feed. You can leave a response, or trackback from your own site.